are the percussive sounds are all from your diy drum machine? if so... wow!! 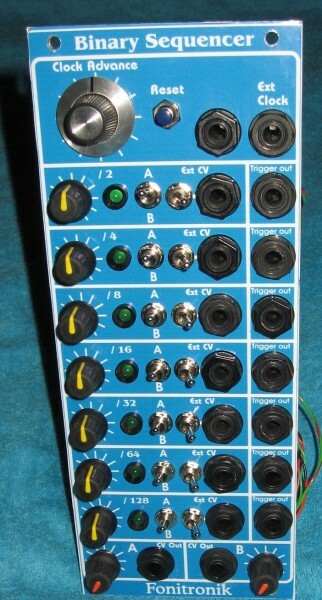 Thanks again for uploading the circuits , Matthias , when I first heard your euro build demos , I knew I had to have this module in my system ,when the module is cycling round, it reminded me of watching the leds fill up the division steps on your simple clock divider I built a few years ago.... http://www.electro-music.com/forum/topic-46786.html . Although I have modded the binary sequencer towards mostly VCO use ,when clocked in time with my VCPS8 sequ, it has been spewing out ideas for new songs/tracks , I have already got 2 new Epicyclus album basic tracks laid down using this after testing & calibrating , cool . since this new version is bi-polar you could use the external inputs for audio as well. and great invention fonik too! Yes Matthias, the lowest divisions attenuate the singnal too much with my mods , but that's ok , I will mainly be using it's CV's into the Soundlab++ & modular vco's . Setting the attenuverter to external inputs only , I patched various sounds from the modular to the first 5 inputs . As the sounds layer up when the division cells clock / stack up, the balance of the summed volumes varies slightly producing an interesting volume effect. /32 = highpass white noise. /16 = pwm square wave vco. /8 = ring mod(2vco's) swept with LFO. /2 = vco with vc-lfo modulation. Also I just had to put some basic drums on too . This test demo has ended up a wee bit like early Fad Gadget or The Normal cool. Finally got the order of stickers I need for a few Fonik projects, yay . A job to finish off from earlier this year , proper sticker for the binary sequencer I built. On the tester layout I printed before , I changed the vertical row of led's & "A" / "B" switches around , during operation I found I was knocking the cv pots when switching , now the new layout has more finger space. hey, this looks just great. alas, it reminds me that i should turn this into a proper project. if there were an easy hack to put in an expander for gating these 2 x jacks per stage and a bunch of 4016's edit: make that max313's forgot the bipolar bonus may give the option - off / A / B / both in that case. I started a new job recently with far better hours hopefully I now get some time back for DIY . sadly been lacking that, old job was 24/7 /365 so I never could plan anything. the new schematic is done already. i even already started to layout a board, alas i did not finish it yet. the scheme on page 2 of this topic ?